I was in Bermuda recently for a family wedding and, at one point picked up the Saturday edition of The Royal Gazette, the island's only daily newspaper. Naturally, I turned right to the comics and I wound up being surprised and puzzled by what I found there. When I came to the page labeled "Colour Comics and Games", I saw the following strips: Dennis the Menace, Pardon My Planet, Hocus-Focus, Family Circus, Bizarro, Garfield, Curtis, Zits, Tundra, Mutts, Blondie, Beetle Bailey, and Mother Goose & Grimm. The page isn't particularly unusual or different from most newspaper comics sections, with perhaps Tundra being a slight outlier since it's syndicated by its artist Chad Carpenter and not through a corporate syndicate. The next two pages were where my surprise started. First of all, that it had more than one page dedicated to comics! 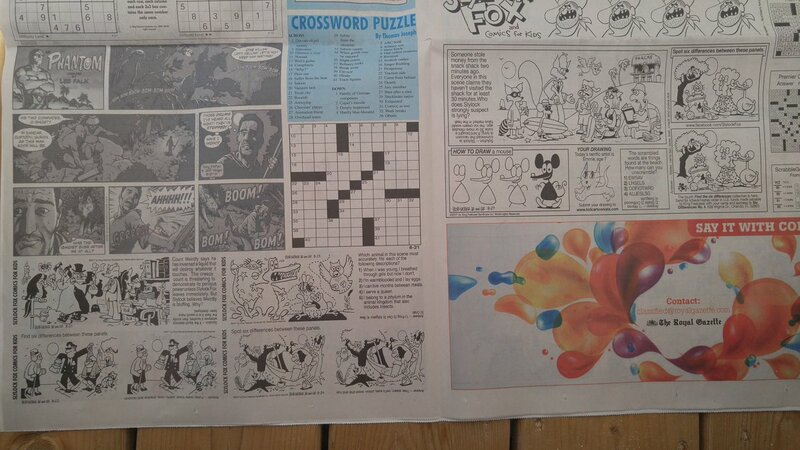 Second, aside from featuring a number of puzzles (including two different crosswords!) 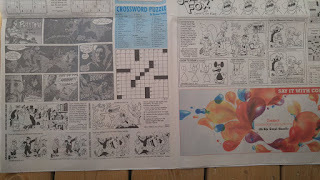 there was a week's worth of Slylock Fox and a Phantom Sunday strip from about two weeks prior. The newspaper doesn't publish on Sundays, so I presume they wind up treating the Saturday paper as a kind of expanded weekend edition. I know Slylock Fox is available in color, so I'm not sure why it's run in black and white; perhaps something to do with the licensing deal that allows them to run a full week's worth at once? But stranger, if you can see by the photo, The Phantom is also run in black and white, even though it appears they had the color version available. It's not just line art they're running. Further, it looks like they dropped the black plate and ran only the cyan, magenta, and yellow ones... but just using black ink. I can't figure out why/how that might come about, either accidentally or intentionally. But there's yet another page and half of comics! (With the remaining half page devoted to horoscopes and a third crossword puzzle!) The comics here are: Popeye, Pickles, Between Friends, Slylock Fox, Hagar the Horrible, Baby Blues, Snuffy Smith, Tiger, 6 Chix, Carpe Diem, The Lockhorns, Hazel, Candorville, Calvin & Hobbs [sic], Dilbert, Curtis, Doonesbury, Mother Goose & Grimm, For Better or For Worse, Mutts, and Peanuts. As you might note, I had already mentioned several of those titles. The ones on this page are from different days -- most of these were from the date of the paper, while the previous ones were from three weeks prior! And more strangely, the titles that appeared in color a few pages earlier were run in black and white here; whereas Slylock Fox, which was in black in white on the preceding pages, was in color here. For the record, I'm not upset by any of this; I'm actually pleased to see they were able to devote so much space to comics! But I am confused as to how they landed on this particular selection of comics. Anyone have any ideas on... well, any of this?